Canon EOS 77D review: DSLR megastar, or one model number too far? 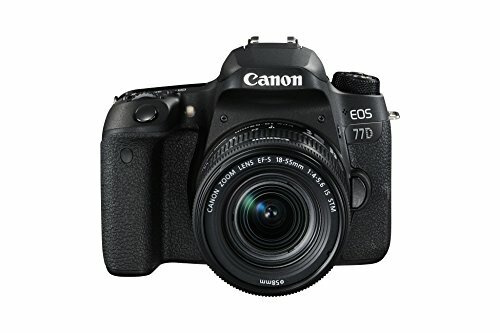 If you've long been pining for a quality all-round DSLR camera than Canon makes a strong case in the 77D. Sure, it's roughly an 80D without the weather-sealing and a few additional features thrown in, but given how masterful that camera was in 2016's market, it's hard to shout the 77D down. You've probably heard it time and again: "cameras are dying". Well, not if Canon has anything to do with it. The Japanese camera maker seems to be investing in a DSLR for every user level, with the latest EOS 77D fitting into the range beneath its 80D mid-ranger to carve out a new sub-category for those seeking a more affordable option. The main difference? The 77D does away with the water-resistant body. Priced at £829, the 77D isn't cheap, but it's lighter on the wallet than the 80D was at launch. So if you don't need every single bell and whistle feature, is this the most sensible sub-mid level DSLR to buy or simply an additional body to line the store shelves? Canon EOS 77D review: What's different vs 80D? If you look across Canon's DSLR range you might be befuddled by the presence of the 77D and 800D in relation to the older 80D, 760D and 750D. That's understandable, given the relative similarities between them all. There are five core differences in the 77D compared to the 80D: the body isn't weather-sealed; the sensor (while the same resolution) is an updated design; the body is slightly smaller and lighter; the viewfinder has a 95 per cent field-of-view (not 100 per cent); and it comes with built-in Bluetooth for file-sharing (and remote control if you buy the additional Bluetooth accessory control (an additional £40)). So in some areas the 77D is actually the more advanced camera over the 80D. You might not think so to look at and handle it, though, as the materials that Canon has come to use in its DSLR cameras don't feel especially robust. That's not the case in reality, however, as during the weeks that we've been carting the 77D around in a bag it's not suffered scratches, bumps or any cosmetic wear. We just think it could be more visually appealing. Despite not being weather-sealed, the 77D has plenty of advanced controls, including the knobs and dials to override automatic shooting just as you'd expect of an advanced DSLR. Like the 80D there are a number of decent higher-end features on the 77D, such as a light-up top plate LCD which can display the various camera settings. It's useful for a glance and knowing what settings are in play. There's also a lock switch to stop any accidental settings adjustment. If anything it's the simpler controls that make best sense though. The rear rotational d-pad, for example, can be rotated to make exposure compensation adjustment with ease, while the top thumbwheel is designated to control the selected mode (aperture, shutter speed and so on). Canon has also introduced a Guide UI (user interface) which can be activated in the camera to assist with breaking-down the meaning of those various shooting modes. It's switched off by default (it's on by default in the 800D), so most users are unlikely to see it — but if you're brand new to such kit then it could be really handy to help you learn the ropes. The addition of Bluetooth has the potential to be useful if you intend to share images from the camera directly to mobile devices. We tend to just stick with removing the SD card and then slotting it into our laptop for optimum speed of transfer, but when out and about the Bluetooth feature via the app did prove to be handy. We didn't have the separate remote control accessory to test for this review. The core thing to take-away from the 77D is that it's got the top-notch 45-point Dual Pixel AF system as found in the 80D (and 800D). That's great for using the camera either through the viewfinder or via the rear LCD screen. Because some phase-detection autofocus pixels are positioned on the imaging sensor the camera is far quicker when using the rear screen than many of Canon's older cameras. Having the screen mounted on a vari-angle bracket is great for low-position work, especially as there's touchscreen control to simply click on the screen for focus. Indeed, live view is as good as DSLR cameras get in this department — although, as we said of the 80D, it still can't quite outsmart the likes of Panasonic's Lumix G range of compact system cameras due to its more simplistic focus options. The Canon can either automatically select focus, or you can press the screen to acquire focus — which will then be continually tracked — but there's no pinpoint precision on offer. As much as we've enjoyed using the 77D's live view mode — in particular in conjunction with the adjusted LCD screen position — it's the through-the-finder focus that produces the best results, as there's simply more control at your fingertips. Of the 45 autofocus points available through the finder, each is cross-type, meaning they're just as sensitive whether you're shooting in portrait or landscape orientation. The only thing that we'd like is a toggle control on the rear of the camera to make for quicker and easier focus point selection, but this is a typically higher-end feature, so its absence is no surprise. To adjust the focus area type there's a dedicated button atop the camera, positioned behind the light-up LCD panel. These autofocus modes comprise: Manual 1-point area, which uses a single point as user selected; Zone AF, which uses a user selected nine point area; Large Zone AF, which uses the 15 points to the centre, left or right sides (a third of the designation); and Auto Selection AF, which allows the camera to make automatic use of all 45 points as it judges fit. When it's dark enough the in-play autofocus point will illuminate red through the viewfinder so you know focus is confirmed. This doesn't necessarily happen in dim conditions, though, so sometimes you might be left uncertain as to whether focus has been acquired or not. On the whole, however, the 77D's autofocus system is very capable. It's spread widely across the subject area and quick to respond in all manner of conditions. Live view abilities are almost equally as quick, but if this is your preferred method of use then you might want to look to a compact system camera like the Panasonic Lumix G80 instead. As we pointed out, however, one of the disappointing things about the 77D is its 95 per cent field-of-view optical viewfinder. It's not bad, per se, but that means you won't see the outermost five per cent of what you're going to capture during preview (with the 80D it's what-you-see-is-what-you-get 100 per cent). On paper the 77D's sensor looks to be the very same 24.2-megapixel one as you'll find in the 80D. That's not precisely the case, however, as it's a newly constructed sensor, paired with the latest Digic 7 processor. Does that make a huge difference to imaging potential? Not really. After all, despite Digic 7's higher speed as a processor, the 77D's maximum six frames per second (6fps) is one less than the older 80D's 7fps, so we suspect that Canon is throttling it to keep the position of each camera within the range in order. Although we're reaching a point where sensors of the same scale, resolution and era are rendering results much the same as one another, Canon is still at the forefront of imaging technology, which translates into the 77D enabling you to take some great-looking pictures. We went on vacation in Santiago, Chile, and were impressed with how well the camera handled a variety of conditions. From shooting Pisco sours at ISO 6400 in the dim evening light, to capturing sunset landscapes over the Andes mountains at ISO 500, or brightly lit cityscapes from a moving gondola at ISO 100. The only thing we needed to do in some instances was up the contrast, but otherwise we've been consistently happy with the colour, quality and appearance of all the images taken with the 77D. Indeed, they're every bit as good as the 80D. Lenses do come into play when getting the best quality from a camera, of course, but we were surprised with just how on-point even the 18-55mm f/3.5-5.6 kit lens managed to cope. When snapping a close-up of a pigeon the sheer clarity of the shot is exceptional from a budget lens. This is Canon doing what it does well: the shot doesn't exhibit over-sharpened excess, instead presenting a natural looking, crisp image. That's not to say the processing is always 100 per cent perfect. Look at images at 100 per cent scale and you'll see an increase in visible grain as the ISO sensitivity rises, with mid-greys showing the subtlest of image noise. Otherwise, however, things are very well handled: just take a look at the Pisco below, how that depth of field delivers depth beyond what you could get from a point-and-shoot, while maintaining ample clarity despite the high sensitivity. Top notch (and very tasty, too). Image quality, therefore, gets a big thumbs up from us. The downside? Video. Canon continues its wont-do-4K approach in its DSLR lineup — a treat it reserves for its Cinema range. The 77D can muster 1080p at up to 60fps though, which is nothing to shake a stick at, but it's a step behind Panasonic again, a company which offers 4K capture from almost all of its compact system cameras, at a lower price point. Still, Canon's touch focus in the 77D is handy for video, so its usability and results are perfectly good. It was only a year ago that we reviewed the EOS 80D, so to see what is effectively an '80D lite' arrive just 12-months later in the 77D is, well, both a good and bad thing. Some 80D owners who don't go shooting in the rain might be wondering why they paid so much when a not-weather-resistant model would follow so soon after. New users, however, have a good option into Canon's mid-level DSLR range. Sure, the 77D's video mode isn't class-leading in terms of features, while Panasonic is a step ahead in screen-based precision shooting with the Lumix G80. That said, as DSLR cameras go, use the 77D via its viewfinder and that 45-point autofocus system is impressive. If screen-based shooting is more your thing then the 77D is as good as DSLR cameras can get — but, again, opt for a compact system camera in the Panasonic and you'll get greater yet performance. If you've long been pining for a quality all-round DSLR camera than Canon makes a good case in the 77D... except the cheaper still 800D, with a slightly more trim feature set, is arguably the more logical purchase point. On the other side the already masterful 80D includes weather-sealing for not much more cash, which, to a degree, see sees the 77D squeezed from both sides by Canon's own range. It's a great camera, just not the most necessary model in the company's range. Not sure a through-and-through DSLR is for you and want the best-in-class screen-based shooting? Then a compact system camera might deliver exactly what you're after. The Lumix G80 is cheaper than the Canon and better specified in many areas too. Throw in pinpoint autofocus and 4K video and it's hard to argue with Panasonic's offering. Looking to save even more cash and don't need some of the 77D's features, like the top LCD? The Canon EOS 800D is probably the more logical purchase when it comes to mid-range DSLRs.